Post summary: Examples how to measure code coverage of .NET Core unit tests with OpenCover. Examples below are based on GitHub SampleDotNetCore2RestStub repository. 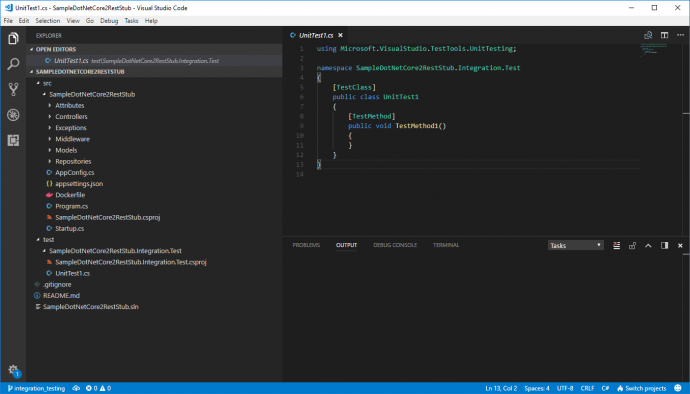 Examples use code from .NET Core integration testing and mock dependencies post. Those are integration tests because they test more than one application module at a time, but they are run with a unit testing framework, this is why current post title is such. This topic is how to do the code coverage on .NET Core unit tests with OpenCover. Theory on what is code coverage, why it is needed can be found in What about code coverage post. 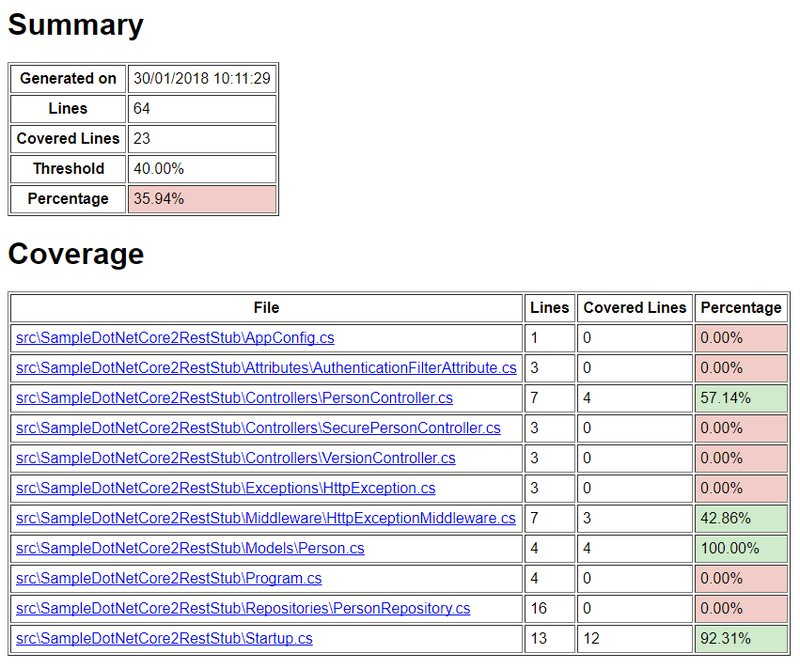 OpenCover is open source tool for code coverage for .NET 2.0 and above applications for Windows only. 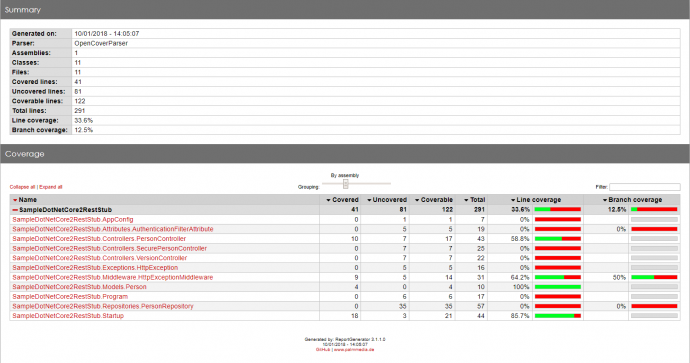 You can read more details about OpenCover in Code coverage of manual or automated tests with OpenCover for .NET applications post or you can visit their OpenCover Wiki page. 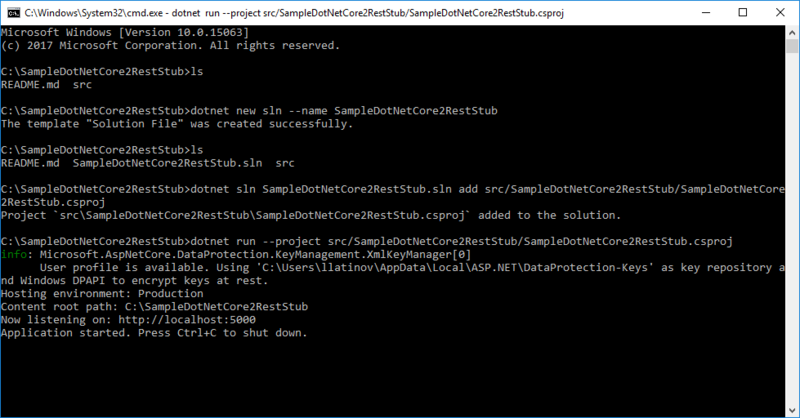 In order to make this examples work you need to check out SampleDotNetCore2RestStub repository to C:\ and run all commands from project root folder C:\SampleDotNetCore2RestStub. OpenCover and ReportGenerator should be installed in C:\ as well. If you have different paths, just adjust them in commands shown below. output file and refer to the Usage guide (Usage.rtf) about filters. guide and the -register switch. 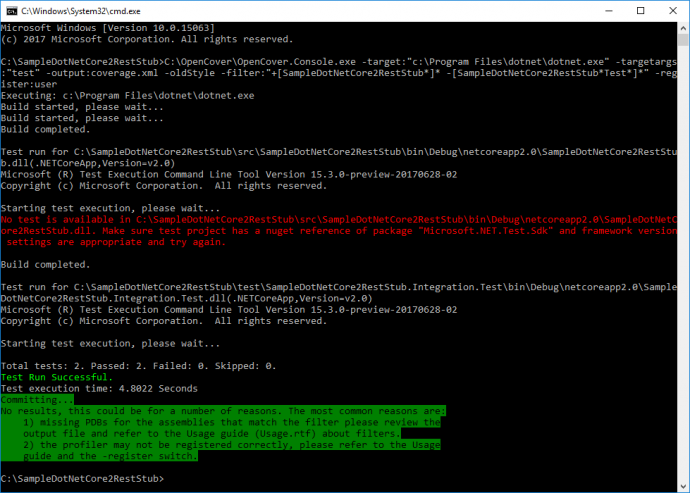 Note: error with red text shown on image above is because with -targetargs:”test” dotnet.exe tries to run tests inside all projects, but src\SampleDotNetCore2RestStub simply does not have tests. 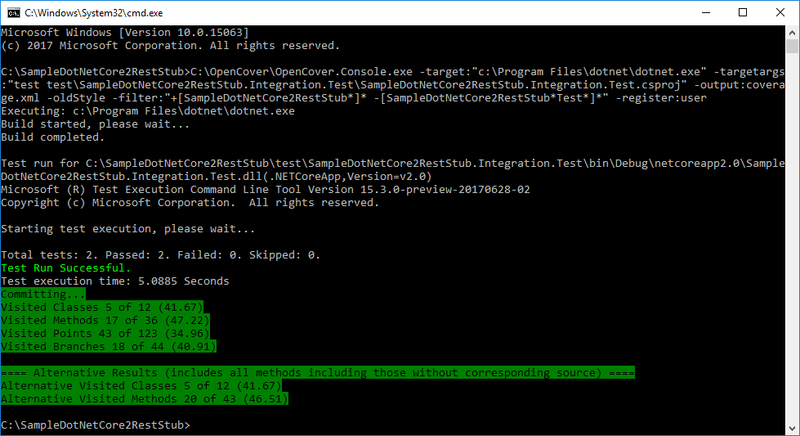 You can refine which test project to get run by changing to: -targetargs:”test test\SampleDotNetCore2RestStub.Integration.Test\SampleDotNetCore2RestStub.Integration.Test.csproj”. The report can be found in my examples: OpenCover .Net Core report. You can see what code is being covered during testing and what not. In this post, I have shown how to run code coverage with OpenCover on .NET Core unit tests. 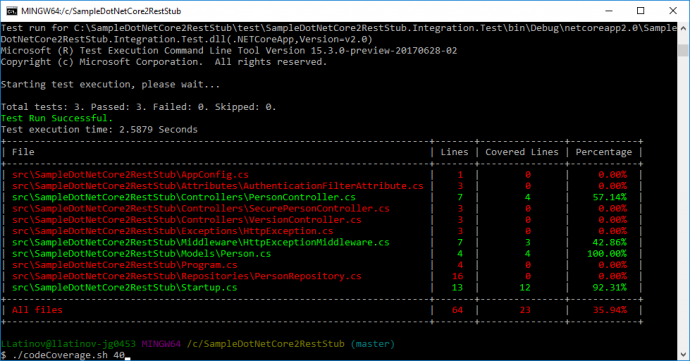 Post summary: How to do integration testing on .NET Core application and stub or mock some inconvenient dependencies. Code below can be found in GitHub SampleDotNetCore2RestStub repository. In Build a REST API with .NET Core 2 and run it on Docker Linux container post I have shown how to create .NET Core application. 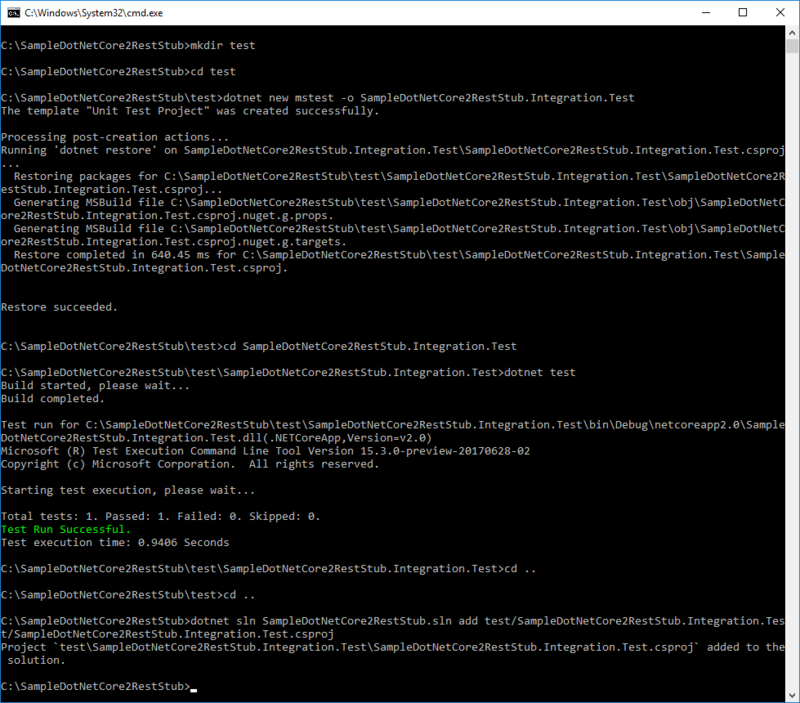 In the current post, I will show how to do integration testing on the same application. The post is for REST API, but principles here apply for web UI as well, the difference is that the response will be HTML, which is slightly harder to process compared to JSON. 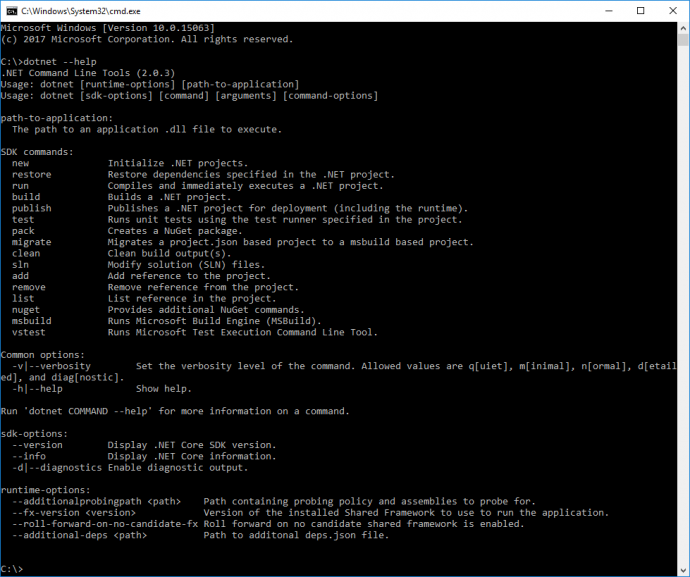 Currently, there is only one project created which contains .NET Core application. Since this is going to grow it has to be refactored and structured properly. 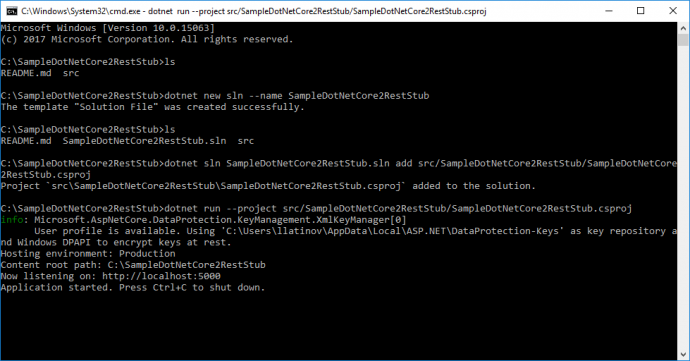 SampleDotNetCore2RestStub folder which contains the API is moved to src folder. 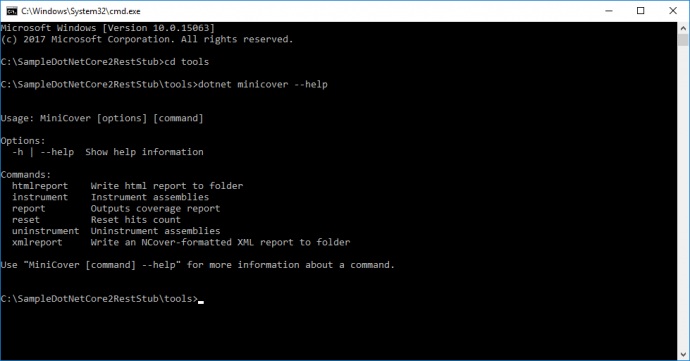 Solution file is created with dotnet new sln –name SampleDotNetCore2RestStub. Note that .sln extension is omitted as it is added automatically. 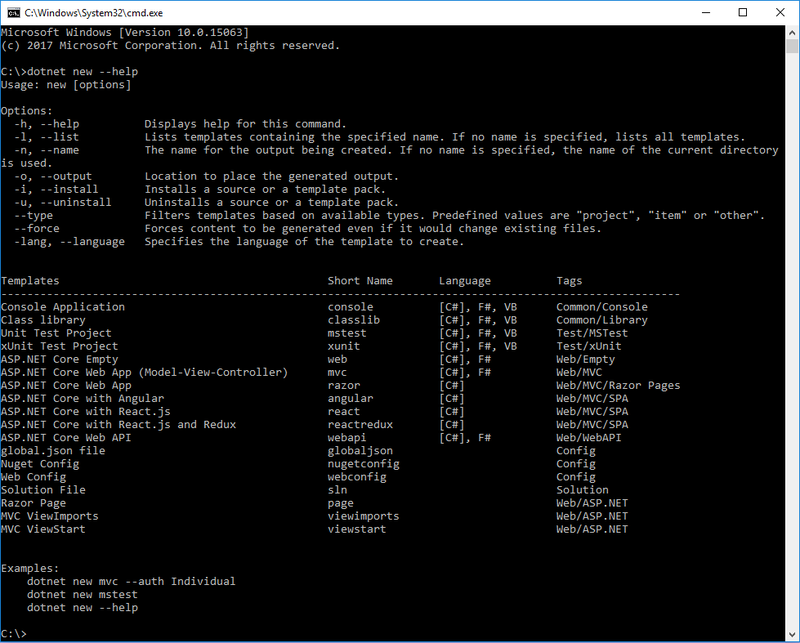 Although everything in the example is done with open source tools, it is good to have solution file to keep compatibility with Visual Studio 2017.
dotnet sln SampleDotNetCore2RestStub.sln add src/SampleDotNetCore2RestStub/SampleDotNetCore2RestStub.csproj. In order to test that moving of files did not affected the functionality, API can be run with: dotnet run –project src/SampleDotNetCore2RestStub/SampleDotNetCore2RestStub.csproj. It is time to create integration tests project. We speak for integration tests, but they will be run with unit testing framework MSTest. I do not have some particular favor of it, it comes by default with .NET Core, along with xUnit, and I do not want to change it. Create test folder: mkdir test. Navigate to it: cd test. 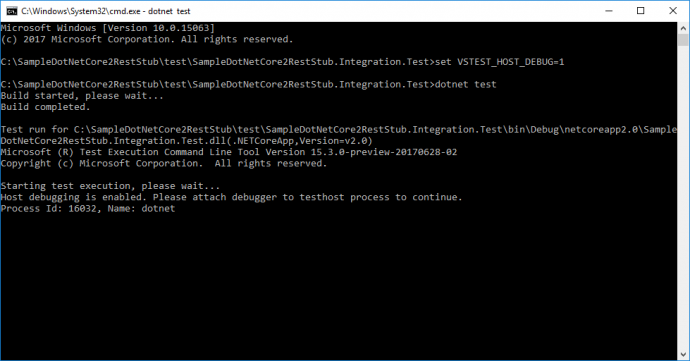 MSTest project is created with: dotnet new mstest -o SampleDotNetCore2RestStub.Integration.Test. 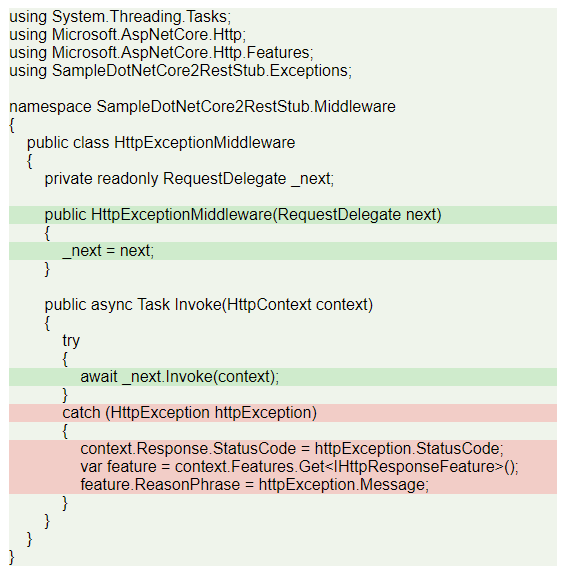 Navigate to test project: cd SampleDotNetCore2RestStub.Integration.Test. Run the unit tests: dotnet test. By default, there is one dummy test that passes. Go to root folder: cd .. and cd ..
Add test project to solution file: dotnet sln SampleDotNetCore2RestStub.sln add test/SampleDotNetCore2RestStub.Integration.Test/SampleDotNetCore2RestStub.Integration.Test.csproj. I would not like to focus on theory and terminology as this post is not intended to, but I have to do some theoretical setup before proceeding with the code. Generally speaking, term integration testing is used in two cases. One is when different systems are interconnected together and tested, other is when different components of one system are grouped together and tested. In the current post with term integration testing, I will refer the latter. In unit testing, each separate class is tested in isolation. In order to do so all external dependencies, like a database, file system, web requests, and response, etc., are mocked. This makes tests run very fast but has a very high risk of false positives because of mocking. When mocking a dependency there is always an assumption how it works and is being used. The mocked behavior might be significantly different than actual one, then the unit test is compromised. On the other hand, integration testing verifies that different parts of the application work correctly when grouped together. It is much slower than unit testing because more and real resources are being used. Some parts of the application still can be mocked which can increase execution time. In the current post, I will show how to run a full application with only the database being mocked. One way to run the fully assembled application is by building and deploying it. Then, the application will use real resources to work. Functional testing should also be done during testing but is not part of the current post. A more interesting scenario is to run fully assembled or partially mocked application in memory, without deployment and run tests against it. This approach has benefits, e.g. since the application is run locally its response time is very low, which speeds up tests; some parts, like database connection, can be mocked and thus speed up tests. 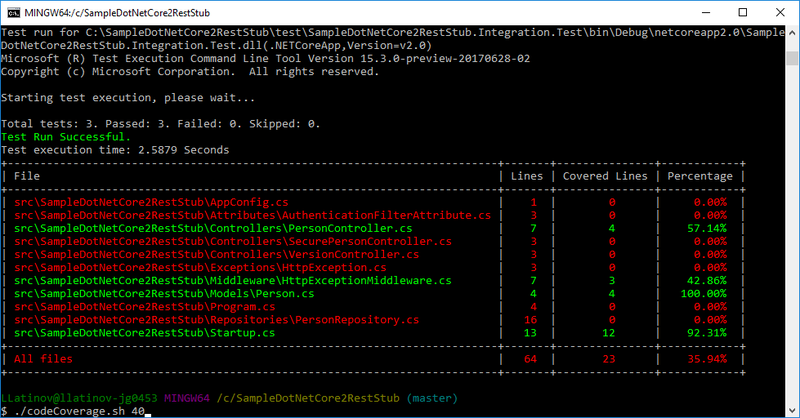 .NET Core Test Host is a tool that can host web or API .NET Core applications serving requests and responses. It eliminates the need for having a testing environment. 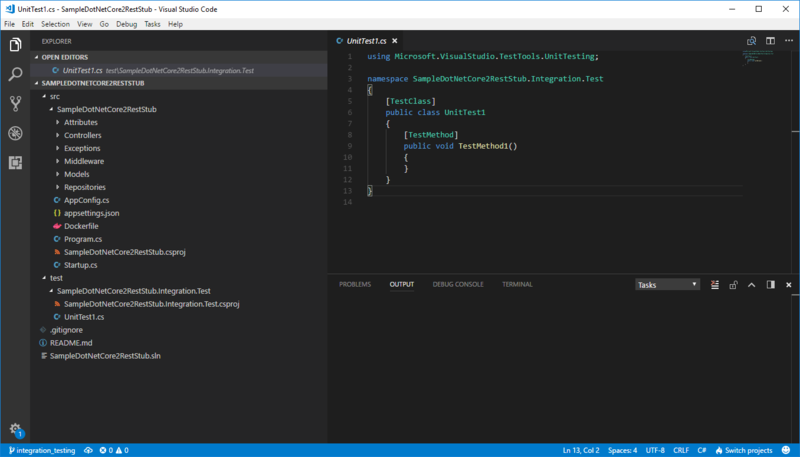 Existing UnitTest1 class will be changed to start application inside test host and make a request. TestServer uses an instance of IWebHostBuilder. Startup from UseStartup<Startup> is same class that is used to run the application, but here it is run inside TestServer instance. CreateClient() method returns instance of standard HttpClient, with which request to /person/get/1 endpoint is made. EnsureSuccessStatusCode() throws exception if response code is not inside 200-299 range. The response is then taken as a string and deserialized to Person object with Newtonsoft.Json, which is now part of .NET Core. Test can be run from test\SampleDotNetCore2RestStub.Integration.Test folder with the command: dotnet test. 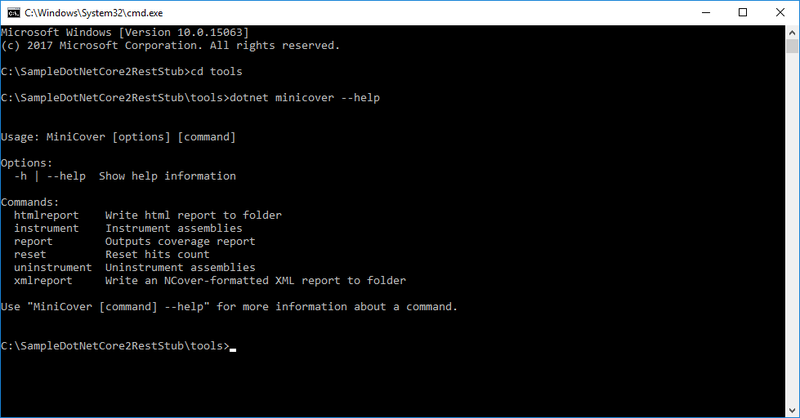 If you type dotnet test from root folder it will search for tests inside all projects. Host debugging is enabled. Please attach debugger to testhost process to continue. 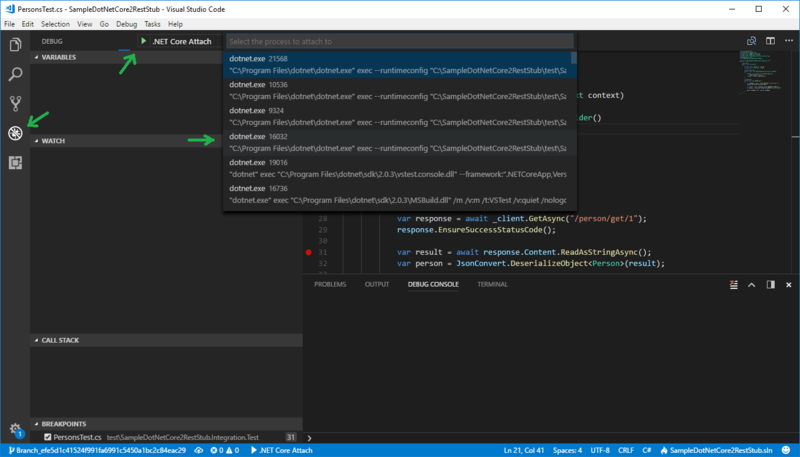 Now from Visual Studio Code, you have to attach to given process, 16032 in the current example. This is done from Debug View, then select .Net Core Attach launch configuration. If such is not existing, add it. 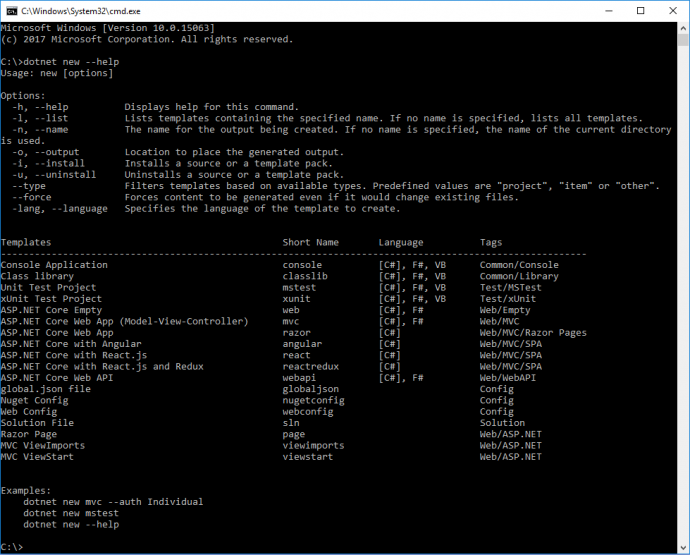 Running this configuration shows a list of all processes with name dotnet. Select the proper one, 16032 in the current example. Tests should be easy to write, read and maintain, thus PersonServiceClient class is created. It exposes methods that hit the endpoints and return the result. Since testing is not only happy path, it should be possible to have some negative scenarios. You may want to hit the API with invalid data and verify it returns BadRequest (400) HTTP response code, or Unauthorized (401) HTTP response code, etc. In order to fulfill this test requirement, a separate class ApiResponse<T> is created. It stores response code along with response content as a string. In case that response string can be deserialized to an object of given generic type T it is also stored in ApiResponse object. Client is instantiated as a protected variable in BaseTest constructor. PersonsTest extends BaseTest and has access to PersonServiceClient. So far there is integration test that starts the application with its actual external dependencies and makes requests against it. Current API service does not connect to a real database, because this will make running the API harder. Instead, there is a fake PersonRepository which stores data in memory. In reality, the repository will connect to a database with a given connection string in appsettings.json, and will perform CRUD operations on it. Database operations might slow down the application response time, or test might not have full control over data in the database, which makes testing harder. In order to solve those two issues database can be stubbed to serve test data. Actually, anything that is not convenient can be stubbed with the examples given below. In order to make stubbing possible and to keep application structure intact Startup has to be changed. 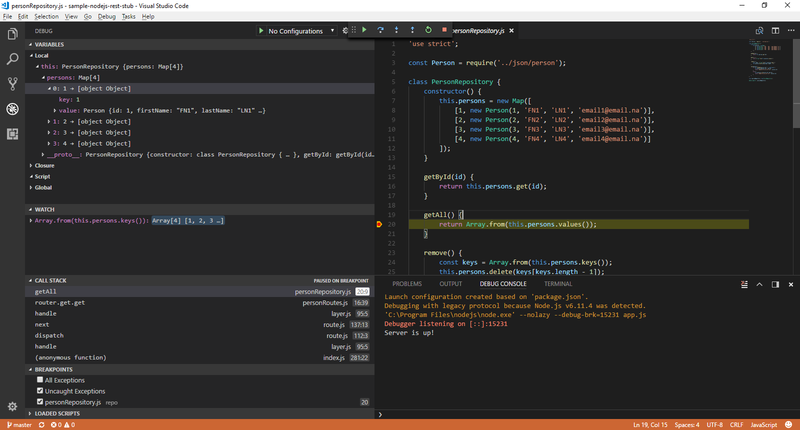 Registering PersonRepository to .NET Core IoC container is extracted to separate virtual method that can be overridden later. All dependencies that are to be stubbed or mocked can be extracted to such methods. Then StartupStub overrides this method and registers stubbed repository PersonRepositoryStub. In it all database operations are substituted with an in-memory equivalence, hence skipping database calls. It might not be a full and accurate substitution, as long as it serves your testing purpose. After all this PersonRepositoryStub will be used only for testing. BaseTest should be changed to start the application with StartupStub instead of Statup. Finally, PersonsTest should be changed to assert on new data that is configured in PersonRepositoryStub. StartupMock extends Starup and overrides its ConfigureRepositories. It registers an instance of IPersonRepository which is injected by its constructor. BaseTest is changed to use StartupMock in UseStartup method. Repository mock is instantiated with PersonRepositoryMock = new Mock<IPersonRepository>(). 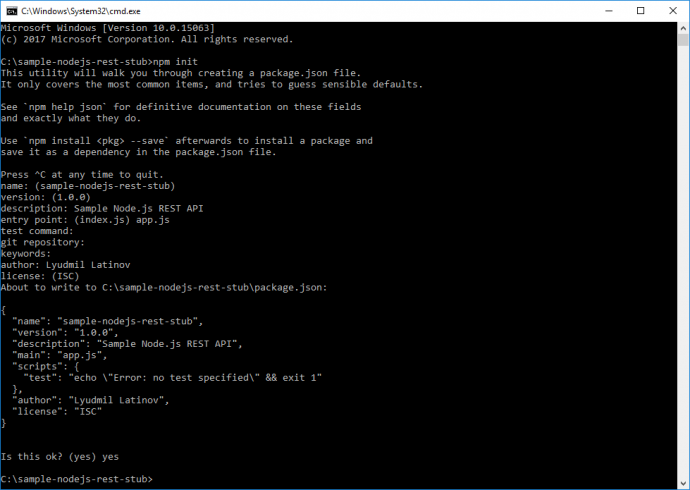 It is injected into StartupMock constructor with ConfigureServices(services => services.AddSingleton(PersonRepositoryMock.Object)). This is how mock instance is registered into IoC container of .NET Core application that is being tested. Once the mock instance is registered it can be controlled. In BaseTest it is reset to defaults after each test with BaseTearDown method. It is run after each test because of [TestCleanup] MSTest attribute. Inside, the PersonRepositoryMock.Reset() resets mock state. Test specific setup can be done for each test. For e.g. GetPerson_ReturnsCorrectResult has following setup: PersonRepositoryMock.Setup(x => x.GetById(It.IsAny<int>())).Returns(_person); That means when mock’s GetById method is called with whatever int value the _person object is returned. Another example is GetPerson_ThrowsException test. When mock’s GetById is called then InvalidOperationException is thrown. 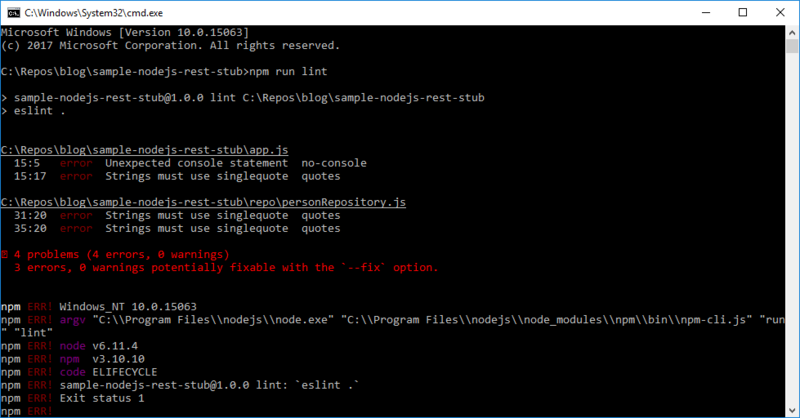 In this way, you can test exception handling, which in current demo application is missing. The exception is not that easy to reproduce if you are using repository stubbing. In the current post, I have shown how to do integration testing on .NET Core applications. This is a very convenient approach which eliminates some of the disadvantages of stubbing or mocking all dependencies in unit testing. Because of using all dependencies, integration testing can be much slower. This can be improved by mocking some of them. Integration testing is not a substitute for unit testing, nor for functional testing, but it is a good approach in you testing portfolio that should be considered.